This past spring when I exited the theater after seeing the pseudo-sequel/prequel, 300: Rise of an Empire, it totally slipped my mind that when the first 300 film came out in 2007, there was a tie-in game released with it. Forgetting about a PSP game shouldn’t be that uncommon a thing, as the system slipped into irrelevancy sometime ago in North America, but even back then it was easy to miss 300: March to Glory. Normally when an impressive spectacle film was coming out in theaters based on a comic, there would be a game on nearly every device imaginable, hell, one month before it Ghost Rider received a game not only on the PS2/P, but the Game Boy Advance as well. 300’s game only arrived on Sony’s PSP, which even then was struggling to obtain market share, with no port to either the similarly powered Nintendo Wii (which came out a few months before,) nor the PS2. In that regards, it’s somewhat progressive to movie games today that only appear on mobile devices. 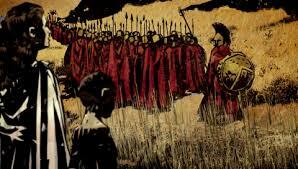 So that being said, does 300: March to Glory deserve to be forgotten? Well, in all honesty no, but just barely. 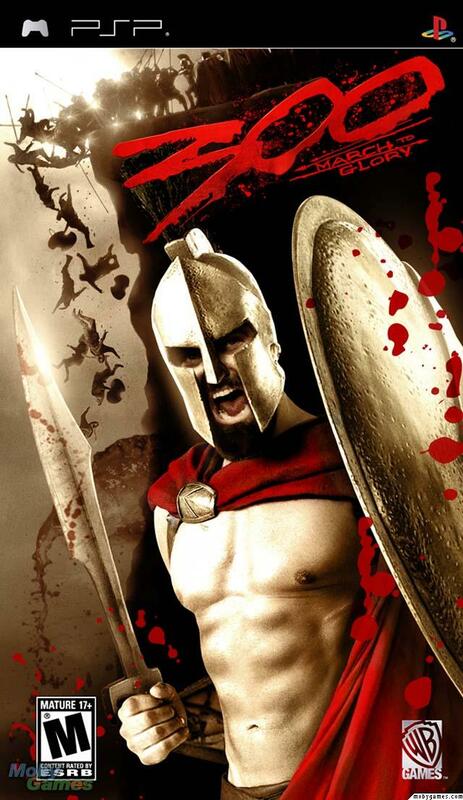 300: March to Glory follows the plot of the film, which in turn is based on a graphic novel by Frank Miller who based the novel on the real life Battle of Thermopylae where 300 Spartan’s fought a last stand against the Persian empire. The only cast member who carries over from the film is actor David Wenham, who not only voices the character Dilios but provides the narration just like in the film. Say what you will about the game as a whole, but Wenham does a tremendous job here and puts the other sound alike voice actors to shame, making you wonder why they never made Dilios the star instead of Leonidas, the character you play as. The game actually does extend beyond the conclusion on the film, I’m assuming because developer Collission Studios didn’t want the game to end on a down note, where you control Dilios in the battle of Platea. I’ve never been a fan of motion comic cut-scenes in games as they’re really put to good use, but in March to Glory they look crisp, beautiful and colorful on the PSP screen, accented by the above narration of David Wenham’s character. The cut-scenes are so good in fact, that they make the in-game graphics even worse by comparison. Now, it may be harsh to critique a portable game for its graphics, but even some of the PSP launch games liked Metal Gear Ac!d closely resemble their console counterparts. The character models present here look like they came from the Nintendo 64, and not even late era Nintendo 64. It doesn’t help that every Spartan looks the same with each having their face covered by their helmets such that outside of cut-scenes where they’re given names, you really have no idea who’s who. Even Leonidas, the main character and Spartan King, gets lost in the crowd until you upgrade your armor and weapons to have different appearances. Combat in March to Glory is what will get you to stick around, as for an uninspired hack and slash, it does some interesting things. 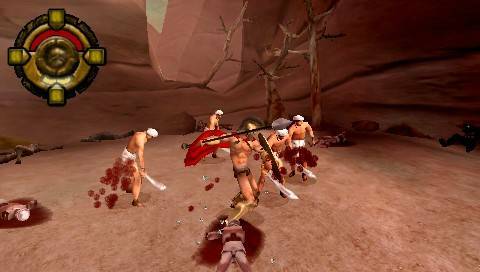 You have access to three weapon types: sword and shield, spear and shield and dual wielded swords. The game forces you to change up your tactics in a way that makes the combat less repetitive than most titles in the genre. Certain enemies that carry shields or are armored, for example, need to be broken by spear before they can be killed or damaged. The dual swords provide more mobility with dodge maneuver, but with a loss of defense from direct attacks and the arrows that literally darken the sky. It’s not enough to pick one weapon and call it a day, and the fights can get pretty thrilling when you’re trying to juggle armored, shielded foes against larger type brute enemies all the while blocking projectile shots from archers. Every so often the game will break up the carnage for some slow paced stealth sections that are poorly executed, but luckily do not carry any get seen once and your dead penalties. The problem lies in the games inadjustable camera that prevents you from seeing anything in front of you to sneak up on anyone. Games such as this, God of War as an example, often have fixed camera angles but in that example, the camera is framed correctly such that adjusting it would be unneccassary, but that’s not the case here. It doesn’t lend itself to cheap deaths in combat, but it also makes the stealth sections a pointless after thought. Outside of the stealth and combat, you control a group of Spartans in the Phalanx, which in the movie was the group joining shield to shield to protect each other from all angels of attack but here you’re marching in a straight line. The objective in these sections is to move forward, attacking low or high depending on if you’re enemy has a shield, push back when they group around your Phalanx or shield when arrow come hailing down. It all seems simple, and it is, but these sections of the game are prone to numerous frustrating glitches. 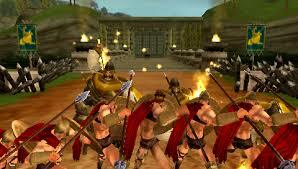 such as if an enemy group pushes against you while you’re ducking to block an arrow volley. You’re options are to push forward and take damage from the aerial attack, or block against the arrows only to not be able to push back, forcing you to restart from a checkpoint. Killing enemies generates currency that allows you to upgrade your offense and defensive equipment, as well as purchase combos and abilities. March to Glory’s equivalent to magic comes in four tiers: a health replenishing move, an ability that increases defense, another that slows time and finally one that increases your attack for a short period of time. 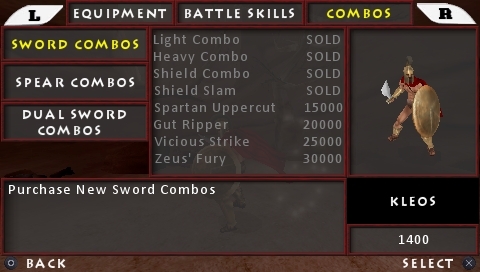 It’s wise when playing to focus mainly on your equipment and some combos, as after finishing this game I only used two of my special abilities (healing and the attack increase that is required for beating certain enemies,) and I didn’t upgrade either ability to even the second level. Under regular circumstances the crowd control, weapon switching combat can be quite fun, however the same can’t be said of the few boss encounters. Instead of having interesting challenges for the skills you develop, bosses just have a layer of armor most times that has to be removed before you can do any damage to them. This involves slowly chipping away at one health meter, then doing it again all the while getting assaulted by an enemy who can take you out with little to no trouble. This is more so true in the last two encounters, with the final one being repeated twice: once with Leonidas, then once again in the epilogue section with Dilios. For a hack and slash action game, 300: March to Glory does have some interesting enough combat as to avoid stagnation and push you through the somewhat short campaign. With a little more polish on the difficulty and the glitches ironed out, I would probably offer a greater recommendation or praise, but I’d still check it out if you want a decent sword and sandals action game on the go, though I wouldn’t actively hunt down March to Glory or pay that much for it.